Dafabet offers trouble-free access to all its services via mobile browsers. It is part of their commitment to feature a comprehensive and fully featured betting experience for those on the go without the added need of accessing a dedicated Android app. The responsiveness is excellent, as is the speed that goes a long way in ensuring crashes or lag doesn’t interfere when placing a bet. All standard navigational features accessed via its desktop version are available to its mobile members, as are its language and banking options, personal account selections, regardless of the smart device accessing it or its screen size. Every sport featured is easily identified by thanks to a user-friendly drop-down menu whereby featured games and upcoming events are listed for each respective sport. Included with each are multiple betting options and posted odds. Open your device’s Settings and browse to the Security options. Allow installing apps from Unknown sources. Go to the website and browse to Dafabet Connect. You will find a specific link for downloading the app or you can also scan a barcode to get it. Install the app on your device and start betting. Note that the app is available only for non-UK customers of Dafabet. iOS users will find that Dafabet provides the same level of convenience as it does for its Android users courtesy of access being granted via a mobile browser. For Apple enthusiasts, it means a trouble-free experience that saves valuable space and time allowing you to focus on smart navigational features and mobile design features. As with those who access Dafabet mobile using Android and other devices, iOS members will find the layout and site to be equal. It is customised to fit the accessing device and includes all features that are seen via the desktop site, and that provides a certain level of comfort appreciated by the discerning punter. An easily located drop-down menu provides easy navigation for sports where available sporting events and their respective odds are conveniently listed. Other betting markets are just as conveniently accessible as is it’s overall performance and ease of use. Here, non-UK players also do not have access to the specific app for iOS devices. There is a software for MAC Desktop computers, but not for iPhone or iPad. One of the convenient elements to Dafabet is the elimination of having to download a mobile app, but that does not mean forfeiting quality, it instead ensures a fully functional, comprehensive mobile version of its popular desktop portal. The Dafabet mobile portal delivers the goods in a user-friendly design that is both graphically appealing and design functional to achieve the best possible user experience while not compromising the performance, feel or its appearance. It further delivers a level of familiarity that mobile users will experience should they access the desktop version when not on the go. Those that prefer the experience of betting via the mobile experience will not be limited to any restrictions in respect to the betting options its desktop partner provides, nor will mobile members discover limitations relating to accessing the different gaming options that Dafabet offers. What is most important is that punters who elect to access the mobile portal using any of the various mobile browsers will be treated to added benefits such as a compatible cross-platform design regardless of the device accessing it. They further experience the convenience of not having to install an app, let alone the time wasted in doing so. Accessing Dafabet only requires users to obtain their preferred mobile browser with their device. Adding to the attractiveness users will find Chrome, Firefox, Safari, Opera Neon, Opera, Yandex, Torch and many others perfect for accessing the Dafabet mobile portal. However, the real value comes using any of the mentioned mobile browsers as it grants immediate access to all sports markets, in-play events and others. Each uses state-of-the-art software that features not only an abundance of gaming options but promotional offers and multiple deposit and withdrawal options, all of which have been neatly packaged to ensure smooth, efficient navigation and naturally designed in a logical layout to allow you access to pages you prefer using drop-down menus and hyperlinks. The layout for the mobile site is equal to that of other popular mobile gambling sites. This is intentionally done allowing for easy navigation and familiarising oneself, albeit, compressed in the right size and allowing intuitive site navigation, both for new and existing members. Navigational links are logically placed and laid out creating a sense of familiarity, user-friendliness, ease of use and delivering information that requires little thought. The main menu buttons that direct to the various gaming categories are located to the left of the mobile site using a convenient drop-down menu. Once directed to the group of interest, all available events, respective of the category being viewed are prominently displayed and have designed with purpose in mind to deliver navigational ease by listing event information in a concise and clear manner that is not intrusive but presented in a concise and clear way taking into account the visual appearance it portrays. 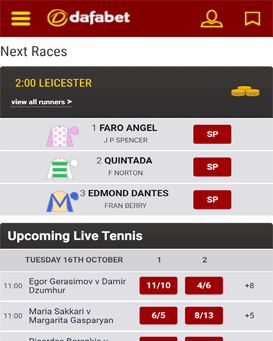 Some of the mobile features of Dafabet include live betting, live statistics and cash out. With this option, customers will have access to betting on live events. This is a good feature where on the move because you can never miss a bet. With the mobile live betting of Dafabet, you can follow the live scores of the available events and bet on dynamically changing odds and markets. There are different sports available which include football, tennis, ice hockey, basketball and more. This feature is connected with the previous one. Live statistics are available for live betting events. They show how the game is going on. With this information, players can choose their bets properly, and their chance to win is going bigger. Another useful service for mobile users is the Cash Out option. With it, customers will have control over their bets and can close them earlier, before the end of the events. That option is trendy among bettors as giving them the chance to minimise losses or get an instant profit. The cash out options of Dafabet can be found in most live betting events. Sports betting at Dafabet is uncomplicated and delivers a full range of games covering a broad spectrum of interests. It includes comprehensive betting options, and its design features shine when wishing to place bets or access information via the mobile portal. There are 23 markets covered including the most popular sports such as American football, Basketball, Cricket, soccer, Ice Hockey and Darts. However, it furthermore includes less followed sports including Cycling, Darts, Motor Sports and Handball. There are also niche markets such as Pool, Aussie Football, GAA Hurling and Volleyball. Those interested in Football will be left impressed by the sheer volume of games for most of the leading European leagues. The same can be said for Horse Racing enthusiasts with both current and future races listed offering early prices and best odds guaranteed. Dafabet further entices with a large variety of live in-play events for Football, Tennis, Darts, Basketball and the PGA among others. This favourite type of betting increases the levels of excitement by delivering high-impact action that only can be characterised as dynamic and by nature, its volatile odds. Is there any mobile offer? No, While Dafabet has compiled a nice selection of bonuses and promotions, none specifically are designed to target mobile users. This is something that could change in the future depending on the number of active players choosing to access the site via their mobile devices. The positive side to this is that punters are able to claim any bonus that is offered, whether that is via the desktop or mobile version, and that makes it convenient and easy, especially if on the road or out with friends. Dafabet bettors will be pleased to learn that virtually all of today’s smartphones are compatible with the mobile site at Dafabet. The same applies to most tablets, but if you happen to have an older device, then you will find updating your operating system, should you run into any problems, will most likely be the solution needed that will allow you access. For mobile betters using an iOS device, it is recommended to ensure your device has the version 9 operating system or higher installed. As for Android users, Froyo 2.0 is recommended when it comes to the operating system. Where Dafabet shines is the sheer number of compatible devices as Apple, Blackberry, Google, HTC, Huawei, Motorola, LG, Nokia, Samsung, and Sony devices will find accessing Dafabet mobile trouble-free. Dafabet has multiple banking options to facilitate both deposits and withdrawals. Its range of financing solutions is available to all mobile users. All deposits at Dafabet are held in separate accounts from other company funds in an account with Nedbank Private Wealth to ensure account holder protection in the event of operational difficulties as required under the UK Gambling Commissions regulations. The table below outlines the methods currently available to facilitate deposits and withdrawals. Dafabet was founded in November 2004 with a focus to provide bookmaking services. Based in Makati, Philippines, and with offices on the Isle of Man, Asian BGE is a privately owned company operating via the Dafabet.com website. The company holds gaming licenses with the United Kingdom Gambling Commission and the Isle of Man Gambling Supervision Commission, two of the most reputable regulators focused on the online gambling market. As such, Dafabet is bound by the regulations and is subject to jurisdictional laws in both the United Kingdom and the Isle of Man. Asian BGE is responsible for all payments processed via Dafabet and subjected to the agreement terms between the company and their third-party processors. Dafabet offers a wide range of high-end betting platforms to thousands of active online members. A large part of its customer base is and still remains, within Asia and the United Kingdom. However, they are increasing their brand awareness in other markets such as Europe, Canada and other international locations. This is based, in part, to its above-average odds, its other betting options, and multiple support and language options. In addition to this, active members are able to enjoy a wide range of daily sporting events as well as an extensive online casino entertainment offering. Its range of products is designed to offer first class gaming to an audience that is globally connected. Do I need a separate account to access Dafabet mobile or am I able to use my existing account? No, when wishing to access the mobile site, you will log in with the same username and password that you use when accessing the desktop version. Why am I unable to see some scrolling banners and pictures when I access my Dafabet account via my mobile device? The answer relates simply to the screen size of your mobile device as not all devices are equal. If the images you see on the desktop version were all added to the mobile version, it would be overcrowded and make it almost useless and cumbersome in so far as you would be required to extensively scroll to locate the information you are in search of. I noticed that one of the bets I made was cancelled. What would be the cause for this to happen? If a game or sporting event is cancelled terminated or abandoned, it will see your bet voided. If this takes place, your stake will be returned to your account for single bet selections, and for multiples, the match/sporting event in question will be declared a non-runner and all others will remain on that betting slip. Am I able to open multiple accounts from the same device/computer? No. Dafabet terms stipulate that only one account is allowed per customer. Breaching this rule will result in your account being suspended. How can I check my betting transactions? To check your betting transactions, simply visiting the “My Account” sections and then the “bet History” button. This will detail all current and past betting transactions you have made. It will include the outcome for each past bet as well as the amount current bets are pay if successful. How do I get in touch with the customer support centre when using my mobile? You will be able to contact the customer support centre in the same manner with your mobile that you do when using the desktop version. The available methods of contact include email, telephone and live chat. Am I able to change my personal information? If yes, how do I accomplish this? Currently, you are able to change your email address and mobile number. However, should you wish to update other information such as your address, you will need to contact the customer support centre. This pertains to identity verification that governs Dafabet’s licensing regulations. Dafabet mobile sets the stage for excellence in respect to functionality, compatibility and flexibility through the ability to customise features and create a platform that suits your needs. While some may dislike not having a dedicated mobile app for UK customers, the benefit of a mobile-friendly portal that is compatible with most devices is advantageous as it is equal to that of the desktop version, and for players on the go, that means time saved. It makes accessing the site a pleasure and allows you to set it up in the same manner to which you are accustomed and most comfortable with. The icing on the cake is the multiple other gaming variants, and with that in mind, we rate Dafabet 8/10.